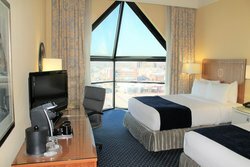 This spacious room features contemporary styling and views of the Virginia Air & Space Museum and historic Downtown Hampton. 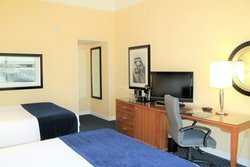 Enjoy a quality night’s rest in two queen beds with plush linens and a lots of pillows. 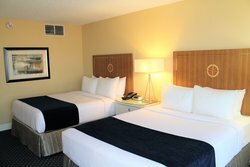 Recharge your devices at convenient charging stations while you sleep. 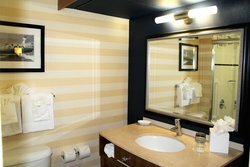 A 32” flat-screen TV is your source of in-room entertainment, in addition to high-speed complimentary Wi-Fi to keep you connected. 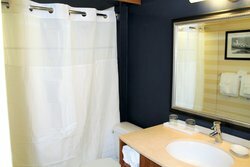 The bathroom comes equipped with a fully tiled walk-in shower and a cosmetics mirror to easily get ready for your day.